The I21 has an engineering heritage that may be traced through generations of class-beating ‘budget’ Primare amplifiers, each the beneficiary of an improved version of the ‘classic’ configuration of JFET input and bi-polar output devices, typical of far more expensive equipment. The amplifier incorporates a massive 800VA toroidal transformer with separate windings for left and right power amp channels, effectively providing each channel with its own mono amplifier. The sheer physical size of this transformer makes it an inherently good mains filter and its low output impedance promotes good voltage stabilisation. As many as four sources can use the I21’s muscular 75 watts and there are flexible output options including pre-outputs for an additional power amplifier. The A30.3 power amplifier incorporates three discrete compact mono channels, each with a separate heavy duty toroidal transformer, a low noise, regulated power supply and ultra-fast bipolar output devices in a push-pull configuration to achieve low output impedance and low distortion. Each channel amplifier is capable of delivering 120 watts into an 8 ohms load and incorporates full speaker protection against faulty input signals. Gold-plated RCA inputs and heavy duty gold-platted loudspeaker terminals maintain Primare's unwavering dedication to high fidelity throughout the design. True to the all the well known and acknowledged Primare design traditions the A31.2 represents another step towards perfection in precision, control and consistent power. The A31.2 design configuration rests on the A30.2 technologies, acknowledged by the world's specialist press over many years for its power and signal purity. Stereo is all about maximizing two channels of sound. To create the right conditions for accurate stereo reproduction, each channel must be treated in the same way, and not have to share resources with the other channel. 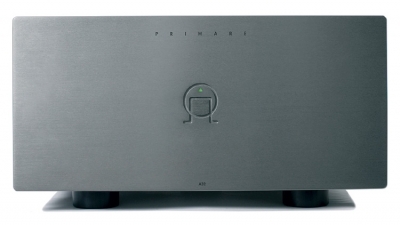 The PRE30 is a high-quality two-channel preamplifier featuring a high-end, fully balanced, design. Its input stage is made with J-FET input devices coupled in a fold back cascade for maximum transient speed. All stages are current loaded and the current source is thermally compensated, which means that no DC servos are needed. The output stage is made with MOS-FET output devices. A custom-made 100VA toroidal transformer and double active regulators are used in the PRE30's substantial power supply, which combines with local regulators to ensure that all stages in the design receive the current needed for best possible performance. The A33.2 is a two-channel, dual-mono, power amplifier designed as the ideal output stage in a hi-fi or home theatre system. Dual-mono design means that each channel has its own identical, dedicated mono amplifier incorporating a heavy-duty custom-made toroidal transformer and low noise regulated power supplies. Each uses four ultra-fast bi-polar output devices in a push-pull configuration to preserve perfectly the fidelity of musical transients and minimize distortion. The amplifier is capable of delivering 120watts per channel into an 8 ohms load (200watts into 4 ohm) and incorporates full speaker protection against faulty input signals. 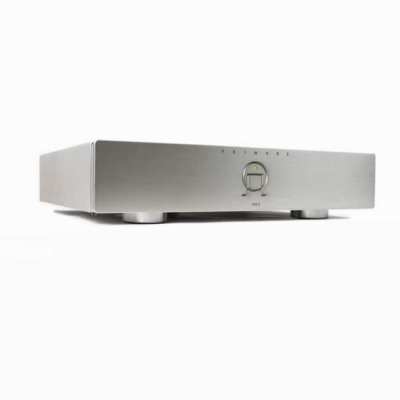 Like its award-winning predecessor, the A30.1, the I30 integrated amplifier has been created to answer emphatically two design challenges: purity in signal transfer and clean distortion-free amplification. For the I30, Primare has re-evaluated the A30.1, changing components where necessary to improve a class-leading design. Its pre-amplifier stage will accommodate six sound sources, including vinyl via and optional phono stage. Sources are selected via a simple, ultra-low noise rotary control. The A30.5 is a five channel modular power amplifier, designed as an ideal output stage in a home theatre. It incorporates five discrete compact mono channels, each with a separate heavy duty toroidal transformer, a separate power supply and ultra-fast bipolar output devices in a push-pull configuration. The input stage of each channel consists of a single FET transistor and the output of four Toshiba power transistors. The heat sinks are massive to keep the temperature at moderate level even at the most difficult working conditions. The A32 is a high power fully balanced power amplifier, conservatively rated to be capable of delivering 2 x 250watts into an 8 ohms load and 2 x 400watts into a 4 ohms load. It is equipped with a fully balanced signal transmission, keeping the signal as free as possible from interference. 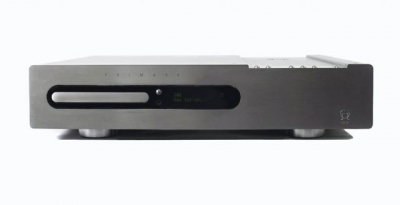 Is this the world’s greatest and greenest A/V integrated amplifier? The new SPA22 combines the advanced control flexibility and upgradable topology of the SP32 with five discrete channels of super-efficient UFPD amplification rated at 120W each. Ultra Fast Power Device technology uses a purified Class D/switch-mode design exclusive to Primare and delivers a natural dynamic quality of sound across the entire audible spectrum while saving around 70% of the energy used to power a conventional amp of similar specification. Combining amazing operational versatility and elite audiophile design with the power to incorporate future technologies, the SP32, like its cool, confident styling, will always be in vogue. DVD-A & SACD 7.1 Input. The CDI10 is groundbreaking news based on Primare’s years of experience in designing digital and analogue playback systems. The amplification is a class-D switch mode design capable of delivering 75 watts into an 8 ohms load. From the high performance DSL 710 CD transport, used with excellent results in several more costly Primare units, through the PCM1738 D/A converter performing conversion from the CD-player and the DAB / FM receiver module, to the wide selection of inputs and outputs, only first class components have been. Continuing the momentum created by the advanced and highly acclaimed CDI10, the new DVDI10 represents the quintessence of a high quality compact system and displays Primare at its innovative best. One beautifully designed and perfectly crafted unit provides you with superb 2.1 channel audio, video in the highest definition, DAB/FM or FM/AM radio, state of the art power amplification and IPod control. The DVD26 shares much of the same technology as the flagship DVD30. A highly specified Analogue Devices video DAC (as used by the DVD30) and nDSP progressive scan chip are utilised to bring a fresh vitality to DVD. Burr-Brown conversion and jitter correction combine with proprietary OP amps and discrete single-ended output stages for breathtaking CD reproduction. The DVD26 uses an R-type transformer with separate windings for audio, video, digital and mechanism to preserve signal integrity. Every component of the CD21, from the CD transport to the audio output stage, has been designed to achieve the highest possible audio performance. 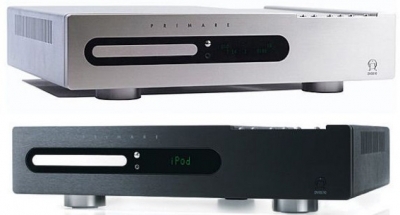 The CD21 uses an excellent low-noise mechanism and a high quality DAC for each channel, which, in synergy with Primare’s discrete circuit topology, restores smooth, undistorted, naturally three-dimensional music to the listener. A very large power supply using a R-core transformer with separate windings for all of the player’s different power requirements and ultra fast discrete power regulators for the critical analogue audio stage, makes sure that enough regulated power is available for even the deepest sonic transient that can be recorded on a compact disc. Extract the last elusive nuance from CD with the elite CD31, which features balanced topology and dual-mono signal paths to shrink the noise-floor almost to zero. This player makes a definitive statement of Primare's elite electronic and aesthetic design ethos. Utilising fully balanced low-noise topology throughout, and the finest discrete circuit components, the CD31 will transcend expectations to deliver musical exhilaration, pure and simple.